In May 2013, representatives from the National Weather Administration in Romania issued a warning about looming drought conditions for south-eastern Romania coming July and August. The news made the headlines for a couple of days, determining the ministry for agriculture to reaffirms its commitment to fight the potential disaster. This is how the story usually goes. People have got used to it. Stories crack open only when the ground does the same. Drought doesn’t strike in an instant and it literally keeps a low profile, working its way through the soil, generating a silent and persistent crisis. But it is hard for a history repeating itself almost seasonally to maintain its eligibility in the public eye. Farmers see the signs, receive the alarms, bear the consequences. Authorities draft reports and aim to close the paper-practice gap. People in the cities are far from the problem, but navigating through supermarket aisles of more and more imported produce can also dry up family budgets. Debates on Romanian agriculture deplore the soils’ untapped potential and human inertia. This sensitive economic sector needs to move forward and in order to do that, it has to smoothly hurdle over natural obstacles. 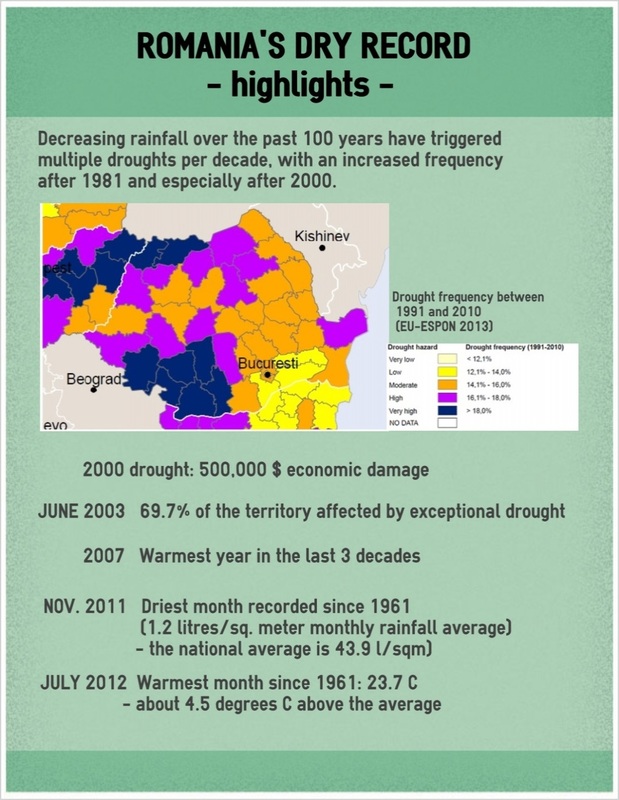 Drought is one of them and this report aims to capture an overview of the recurrent story. According to IPCC predictions, in the coming decades, Southern Europe will be affected by serious temperature increases and a shortage of rainfall. Extreme summer temperatures may increase by 5 to 6 degrees Celsius in the south of Romania, with longer, more frequent and harsher heat waves. Calculations at the National Weather Administration point toward a 20% fall in precipitation between 2020 and 2040, with the national rainfall average dropping to 476.1 mm rain input (switching the climate labels from moderately droughty to droughty). Basically, more land will be exposed to more intense droughts. 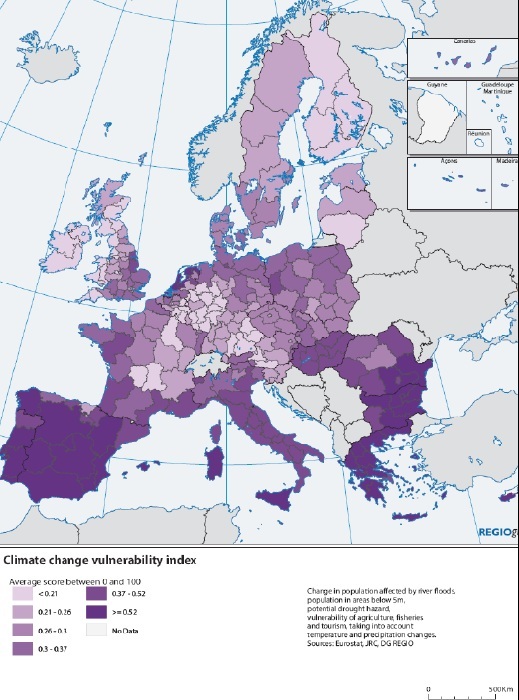 In analyzing the future climate challenges European countries are exposed to, the European Commission has mapped the climate vulnerability index across the continent, with Romania standing out as one of the most vulnerable countries, especially in terms of increasing temperatures and decreasing rainfall. (Note: the index takes into consideration in equal terms information on vulnerability to drought, population affected by river floods, exposed to coastal erosion as well as agriculture, fisheries and tourism’ exposure to climate change). But Romania’s climate record isn’t the cleanest either. 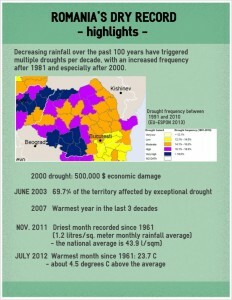 While Europe has experienced a 6 to 13% increase in droughts over the past 30 years, Romania has experienced one to 3 or 4 years of drought per decade, starting with the early 20th century, with an increased frequency in the 1980s and afterwards. Recordings indicate 19 extremely dry years in the 20th century, with the 1940s, 1980s and 1990s at the top. But the 2001-2010 period experienced 5 years of extreme droughts, with 3 consecutive extreme events between 2000 and 2003. 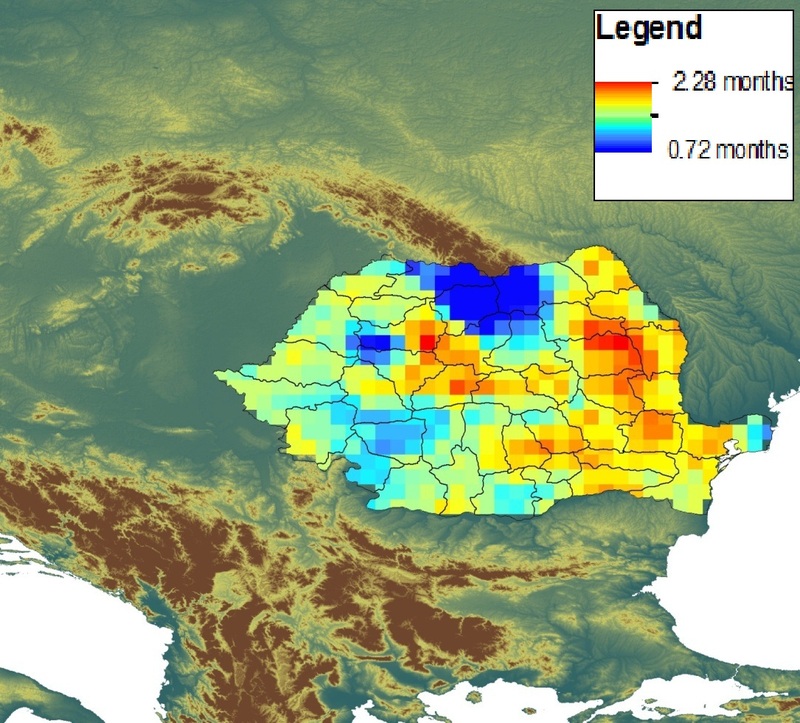 The map below shows a general picture of how long a drought takes across Romania’s territory. Sources: Romanian National Weather Administration, DG Regio. Given the natural climate variability, climate change scenarios and the increased vulnerability to future droughts, Romania should be fully equipped for combat. However, one of the main foundations in the battle against increased aridity, the national irrigation system, has long been in a lock-in situation. We know what are weapons should be, but decades of technological demise have widened the gap between theory and practice. Official reports continue to confirm it. The Strategy for Sustainable Agriculture 2014-2030, recently released by the Presidential Administration lists irrigations as an urgent priority, as well as one of the factors that contribute to Romania’s underperforming agriculture. But what has really happened to the irrigation system? Here’s the present situation, in brief. 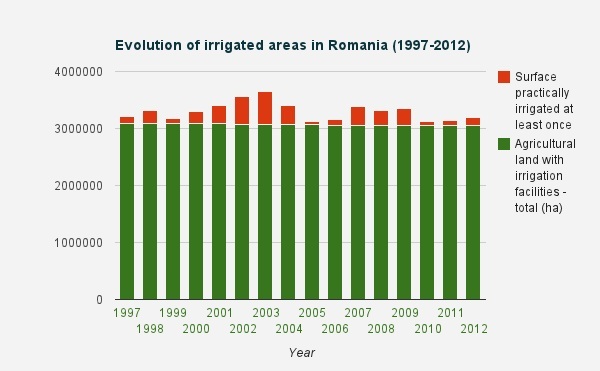 In 1989, Romania had about 3 million hectares of arable land irrigated. This figure has plunged dramatically in the following two decades, with around 2-5% of the supposedly equipped surface actually receiving water between 2010 and 2012. A peak of 18.5% of the surface was achieved only in 2003. - The two-faced rise of the irrigation system – political considerations underpinning its creation were much based on size, replicating the megalomania displayed in industrialization and housing developments around the country. 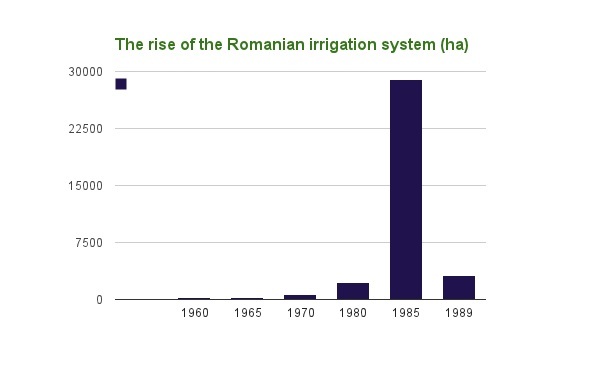 Practically, Romania’s irrigation systems were “gigantic”, designed for large agricultural production cooperatives comprising of 20 to 100,000 hectares of land. On the other hand, technical lacks and design misfits have made Romania’s irrigation system one of the most energy inefficient: most developments involved pumping stations at high levels which inquired high electricity costs. Furthermore, about 50% of the open water transport and adduction channels have not been waterproofed, still currently producing losses of about 40%. - land retribution after the fall of communism has produced a size discrepancy – small farmers who got their land back (having now, according to the National Authority for Land Improvements an average of 2.1 hectares) cannot manage the large irrigation facilities, with an average size of 28,114 hectares (a surface 10 to 200 times more than the EU average – where the average land exploitation is 38 ha). - a killer combination of indifference, abandonment, theft, destruction and legislative inconsistency with the new realities of the post-communist Romanian agriculture has led to a major degradation of the irrigation network. - authorities have not been able to keep up with the demise of the irrigation system – there is yet no exact registry of irrigation infrastructure. - there is no warning system for irrigations, with incomplete works even in very dry years – i.e. 1993, 2003, 2007. - between 2004 and 2009, despite an increase in irrigation financial assistance, the surface irrigated has not surpassed 300,000 ha. - between 2006 and 2009, although the surface initially contracted to be irrigated increased, the area which actually received artificially any water has decreased, varying on an yearly basis. 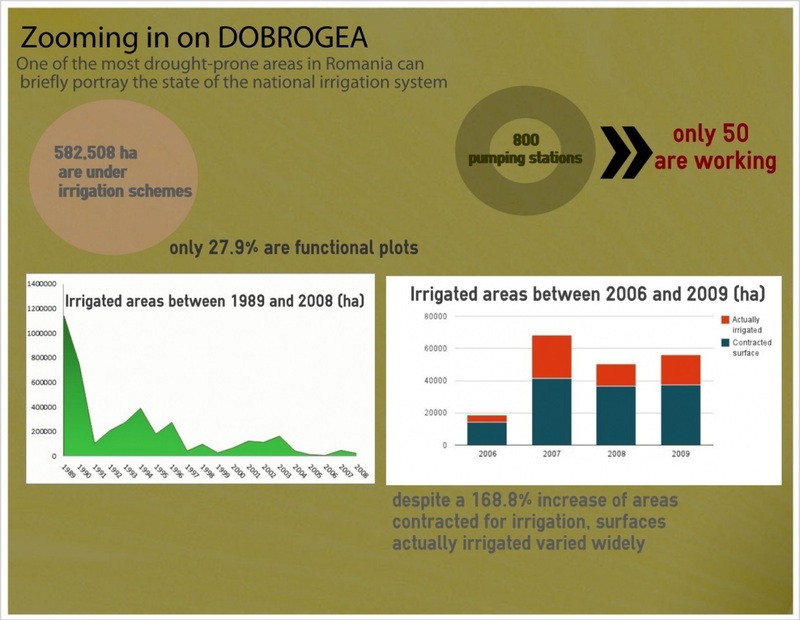 One of the most drought-prone areas, Dobrogea, does not deviate from the general numbers. The infographic below sums up a nation-wide problem.